Description The Bluegrass Heritage Museum brings the history of the area to life for both the old and young by collecting, preserving and exhibiting objects valuable to the history of Winchester, Clark County and the Bluegrass region of Kentucky. 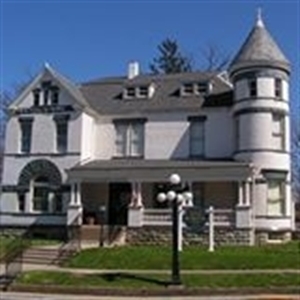 Housed in the historic Guerrant Clinic building on Main Street in Winchester, the Bluegrass Heritage museum covers the history of Bluegrass people and places from the Eskippakithiki Indian settlements to today. This was America's first Western frontier and it attracted colorful adventurers like Daniel Boone and Simon Kenton, whose real-life escapades could only be exceeded by the imagination of a Hollywood screen writer. This region is the burley tobacco capital of the world. No other museum in America tells the storied history of how this crop not only helped shape the American economy, but formed a specific culture and way of life that continues to this day. Contrasted against the small family tobacco farms are the vast grasslands and ornate mansions of the region's thoroughbred horse farms. The ancestors of these largely agricultural families first came to Kentucky on the Wilderness Trail, which led them straight to Boonesborough and what would become Winchester, Kentucky. They created a major riverboat industry with barges and flatboats that transported lumber from the vast virgin forest of Eastern Kentucky and provided a new nation with what seemed like a never-ending supply of wood and coal. These tremendous stocks of raw materials were shipped throughout America by rail and an intricate system of tracks that spread from the eastern coalfields to the Bluegrass. That history continues to this day with the Interstate Highway system that cuts through the heart of the region. Today, instead of coal and lumber, people of the Bluegrass use their central location to ship a wide array of products - from Toyotas to bourbon to Lexmark printers to Ale 8-One soft drinks - all across the world. But, it's the lifestyle and culture of the Bluegrass people that charms so many people. It's part of the reason why natives from the region often call the Bluegrass Region home no matter where they live. What other region can boast of an original genre of music that carries its name? Kentuckian Bill Monroe helped create a legacy for the Bluegrass music that continues to this day. This is the story of a place and a people. For the first time ever, the essence of this tale will be told in one place: the Bluegrass Heritage Museum. Add Bluegrass Heritage Museum to your free online travel itinerary.